The new 'Grinder'? 'The Torturer'? It matters not one jot to Mark Selby. Why would it? World champion. Now that has a splendid ring to it. "It sounds great but it's still not sunk in, and probably won't until the season starts again and I get announced as world champion," Selby told BBC Sport a couple of days after his epic victory over Ronnie O'Sullivan in snooker's showpiece event. "It's been non-stop since winning it, with all the interviews and all the rest of it so I've not had that much time to sit there and let it sink in. "It has been a long time coming but I always thought I would win it. Nobody can take it away from me." It was O'Sullivan who described the 'Jester from Leicester' as a 'Torturer' - a compliment about Selby's stickability and spirit. And the moniker seemed particularly apt after the 'Rocket' was on the receiving end of a stunning Selby fightback in Sheffield which was watched by a peak BBC television audience of nearly six million people. Selby has become synonymous with his ability to scrap, battle, irritate and and frustrate. None more so than at the Crucible when he came back from 8-3 and 10-5 down in the final to win snooker's most coveted prize. He was rewarded for that display with 'Performance of the Year' at the sport's awards dinner on Thursday. But when the question of how he is regarded crops up, Selby, 30, is not worried. Mark Selby is one of only nine players to have won snooker's triple Crown of the World Championship, Masters and UK Championship. Terry Griffiths, Alex Higgins, Steve Davis, Stephen Hendry, John Higgins, Ronnie O'Sullivan, Mark Williams and Neil Robertson have all completed that hat-trick, but only Davis, Hendry and Williams have done so in the same season. "Being mentioned in the same bracket as those names is incredible. They are legends of the game," said Selby. "In a way I prefer it like that," Selby said. "I would rather be known as someone who never gives in rather than someone who throws his toys out of pram if he's not playing brilliantly and it's not going well. "It's my attitude that I never give in and I have that will to win. Until that final ball is potted you have to scrape me off the table. "I never lie down, which I think is one of my biggest attributes and I showed that in the final against Ronnie when I was 8-3 and 10-5 behind. I'm proud of that." Marrying the "ugly side" side of snooker with the flair may not appeal to those who lap up the all-out attacking approach of an O'Sullivan or the flamboyance of Jimmy White or Alex Higgins. But White has never won the world title, despite reaching the final six times. Selby has the talent, the temperament and the trophy cabinet to prove it. A three-time Masters champion and a former UK Championship winner too, he is one of only nine men who have won snooker's Triple Crown. No matter how much of a battler you are, that sort of success does not happen without having quality in abundance. His superb 147 in the UK Championship this season showed his class can match his much-heralded matchplay. Selby, the 2007 World Championship runner-up, has a 50:50 record in the final after Monday's triumph. But a first world title seemed unlikely as this season's appearance started to take a familiar form to his previous time in the final when he lost out to John Higgins. "Seven years ago I more or less felt exactly the same in the first day of the final and I was 12-4 behind and I put in a really poor performance and it was pretty much over," Selby recalls. Although he fought back to 12-10, Higgins ground out a tense 18-13 win. This year his exhausting semi-final win over Neil Robertson affected his first day once again, but his experience paid off. "I learned a lot since then as I was going in there as a qualifier and was there with no expectations and every match I won was a bonus," said the new world number one. "This time, hanging in by winning the last two frames on Sunday was probably the difference between winning and losing the final. "If I had been 11-6 or 12-5 down it could have been as good as over. After the late session against Neil the night before I had nothing left mentally and physically, but coming out of the first session of the final at 10-7 I was still fully involved." His subsequent win means he can retire a happy man when he does finish playing and have "no regrets" - although that is still a long way off. "I always believed I was capable of winning it but until you actually do it you will still doubt yourself a bit," said Selby, who was nearly forced to quit the sport because of injury in 2012. "And to beat O'Sullivan in the final is a fantastic achievement and makes it a wonderful season. If I had to pick one player to beat it would definitely have been Ronnie. "In the last few years every time I go to a tournament I believe I can win and if I don't win, I see it as a failure. "Winning the Worlds makes the season amazing. It's such a hard tournament. "It seems surreal. Even though I had the belief I would win, it is still weird. Having been in the final and lost, you never know if you will get there again. The more the years go by the more the doubts will creep in." 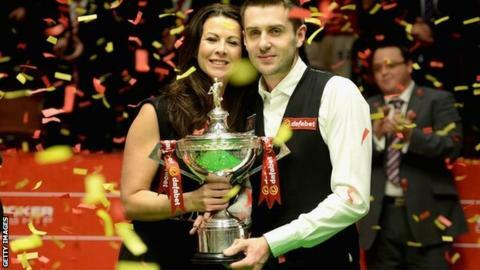 An emotional Selby celebrated his success with wife Vikki immediately afterwards and then dedicated his victory to his father David, who died of cancer just before his son turned professional in 1999. "He is the reason I got into snooker," Selby said. "All he ever wanted was to see me turn pro and win tournaments. I know he is looking down and smiling. "He never pushed me. As long as I was happy, he was happy. He was always there for me."